Gas is high. Expensive. Often necessary. The same goes for auto insurance. That said, how about a free $20 gas card? How about that free gas with an auto insurance quote - just to ensure that the rates you're paying are the lowest they could be? 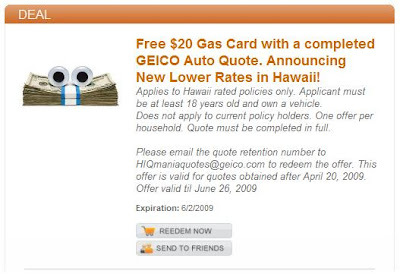 Free $20 Gas Card from Geico Hawaii! To receive the free gas card, you'll have to have a Hawaii rated policy, own a vehicle, and complete the process to receive a free auto quote. So if you're in Hawaii and want to check out how much you could save by switching auto insurance, you will receive not only that information from Geico for free, but you'll also receive a free $20 gas card. Quote must be completed in full. We at Qmania are proud to help spread the word on the best deals around. If you're a business owner, learn more about what and how we do here.